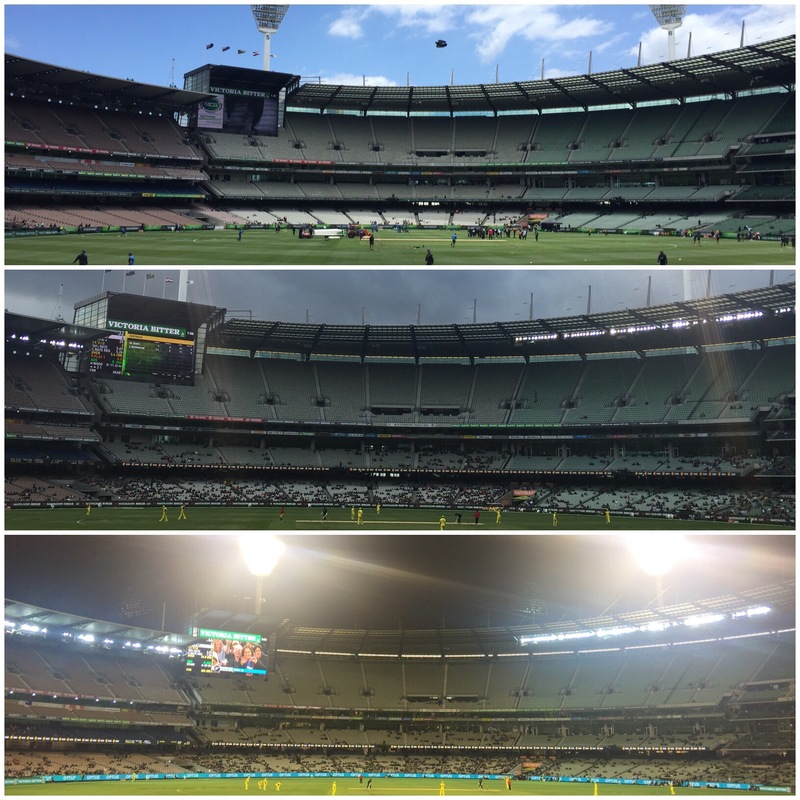 Cricket is one of the things Australia is known for so we were always planning on seeing a game while we were in Aus. 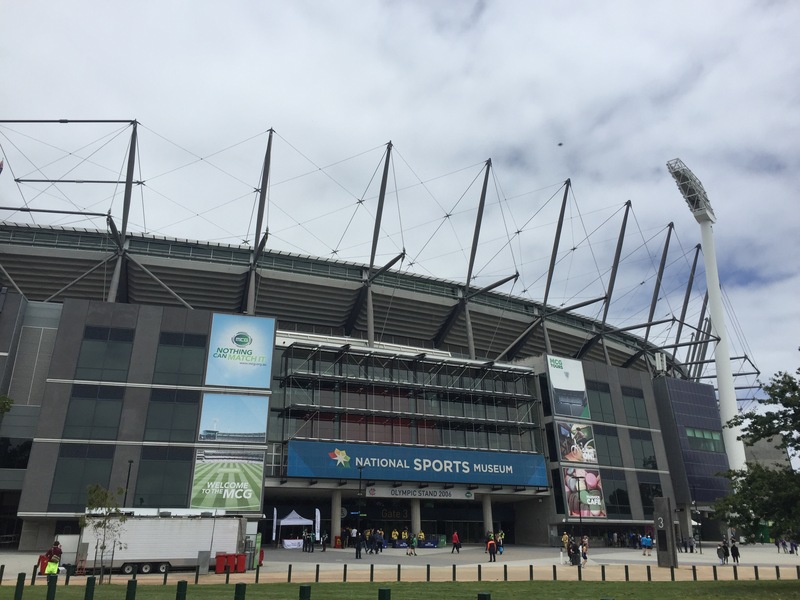 The Melbourne Cricket Ground (MCG) is pretty well known and, when I’ve asked locals what I should do while we’re here, it’s a common suggestion to go see a game here. 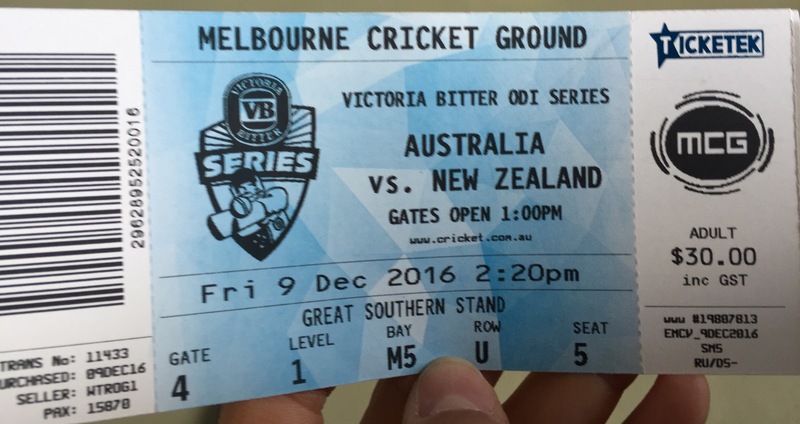 We already had tickets booked for the Boxing Day test match with two of my friends before we flew out here but Niall saw that there was a one day international (ODI) on between Australia and New Zealand and, as we had nothing to do, we decided to go – that was on Friday (9th December). We woke up to torrential rain and so weren’t sure if the match was going to be on but the rain stopped and so we packed food and a bunch of layers and headed to the ground. The MCG is really close to where we’re staying so we can walk there in around 10 minutes which is really handy. The ground is huge, way bigger than St James’ Park and there were people around the grounds who had face paint to paint the team colours on your cheeks for free. Niall didn’t fancy it but I got both the team colours on my cheek to stay neutral. We had got there early to pick up our tickets so we had a walk around the outside of the stadium which has a lot of statues of famous sportsmen like Shane Warne and information about their achievements. The weather was overcast and I had been told by Niall that it would be around 8 hours long so I was a bit apprehensive about how I’d find it! I kept an open mind though and we went into the grounds for the match to begin. Luckily, pretty much as soon as we sat down, the sky cleared and the sun came out. The weather forecast said it would be around 16 degrees but it definitely felt hotter than that. It actually got so sunny that we burnt a bit and some people burnt really badly. The ground has a first aid department that had big tubs of sun cream outside for everyone to use as well as people walking through the stand with sun cream and sweets (to keep your blood sugar up) which was really helpful as we’d forgotten our sun cream with it being so cloudy and cold when we left the house. When it was New Zealand’s turn to bad it wasn’t as exciting as Australia batting because there would be a lot of overs with little to no runs being achieved by NZ. As it had been going on for around 6 hours at this point, people were really drunk in the crowd. Niall had told me about these ‘beer cup snakes’ where the crowd stacks their plastic cups into a ‘snake’ until the stewards come and take the cups away (if you’re struggling to get what I mean, google it to see how long they can get!). That started at this match except, instead of the stewards just taking the cups away, they started kicking people out. This led to the crowd all shouting/ chanting at security and lots of funny scenes of people trying to avoid being caught. It was funny to watch and was a massive overreaction by security to what was just a harmless game. 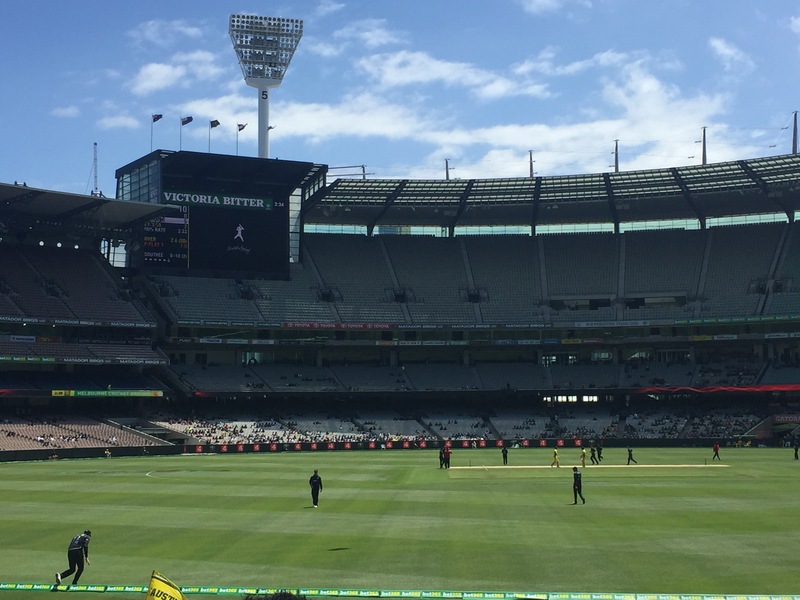 The crowd also did a Mexican wave which went around the grounds 3 times before stopping – apparently the MCG has banned Mexican waves but no one seemed to try and stop this one. I hadn’t really expected how much goes on at a cricket match. There were big screens that had animations for when the ball went wide, a dress up competition as well as funny music being played when the camera went on members of the crowd and a dance cam. I haven’t ever really watched a game on TV either so had always seen cricket as more “civilised” than that – made it more entertaining though so I’m glad they do it. The game ended with New Zealand being bowled out and Australia winning so it ended a little earlier than we had expected but still nearly 10pm. The ground was pretty split between Aussies and Kiwis so the atmosphere was great. I thoroughly enjoyed watching it and it makes me more excited for the Boxing Day one as I’ll now know what’s going on! 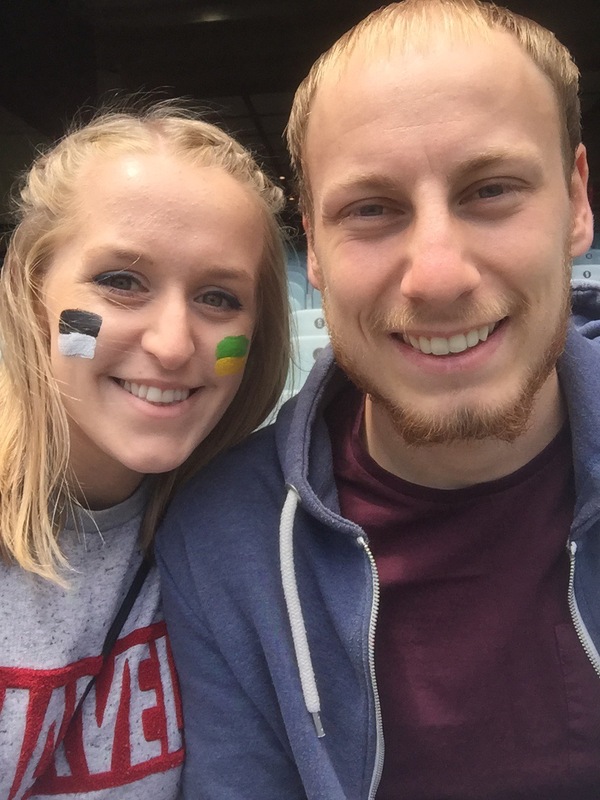 If you ever get a chance to go watch a cricket match I would go, but I think that if you don’t know about cricket like I didn’t, make sure to go with someone who can explain what’s going on. I would have been very bored if I hadn’t had Niall there to help me understand what was happening and get me engaged in it all!